Thunder Reef Divers offers both NAUI and PADI classes. Both of the certifications are recognized worldwide and the training is based on the same standards. If you have a preference or need for one agency over another agency come talk to us. Phone: (360)573-8507 happy to talk about scuba diving anytime! Includes all dive gear other then your personal gear. Required personal gear is – Mask, fins, snorkel and boots. 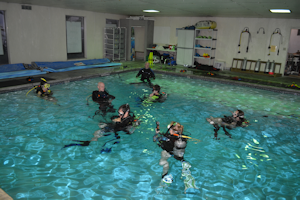 This is the class to become a certified scuba diver! We offer the ability to schedule a class in a private or semi-private setting. These classes can be tailored to meet your needs in terms of days and times for the academic, pool and open water training. Perfect for a family or busy professional when the public classes do not fit your schedule or needs. Download a flyer here for more info on setting up this type of class.